ENGLEWOOD CLIFFS, N.J. — With Winter right around the corner, dropping temperatures and low humidity isn’t great news for your skin, especially for cold-weather dwellers. Luckily, Vaseline has a solution for the winter blues just in time for the busy holiday season. The brand announced today the launch of its free #SaveMySkin kits, available exclusively this week (December 6 – 7, 2018) to U.S residents nationwide. During this limited time offer, through a partnership with experiential technology platform Fooji, fans anywhere in the U.S can simply Tweet using a custom hashtag and emoji to participate in the giveaway and receive their package. 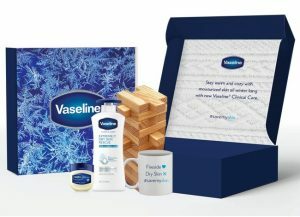 With each free delivery, people will receive two Vaseline products aimed to rescue dry winter skin – their newest lotion, Clinical Care Extremely Dry Skin rescue, and the iconic Vaseline Petroleum Jelly – as well as a cozy mug and classic games to keep the family occupied. Enter your information and place your order, and a Winter Care package will be delivered to your door within a week. Chicago residents don’t have to wait for cold-weather relief – in tandem with the Vaseline winter freebie, starting at 10:00am CST on December 6th the brand is stopping in the windy-city for the second leg of its Save My Skin pop-up airstream tour to bring the healing benefits of its Clinical Care™ line to locations in Pioneer Plaza and Hyde Park. *Packages are limited to the first 1,000 consumers while supplies last.